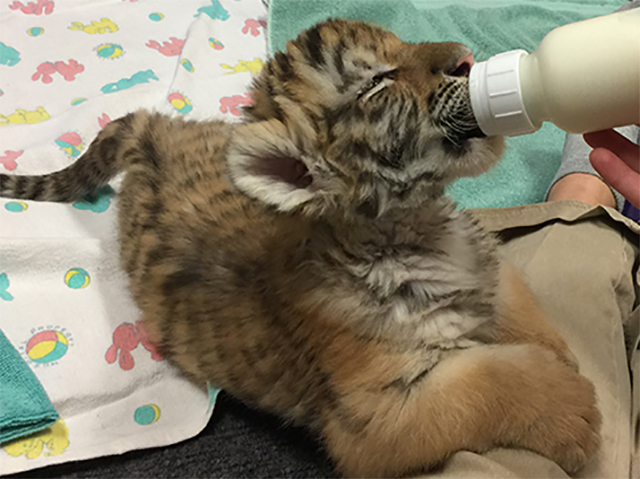 Hand-Raising Kash | Kid Reporters' Notebook | Scholastic Inc.
Kash, an Amur tiger cub, is bottle-fed at the Milwaukee County Zoo after developing an infection. His name is Kashtan, which means chestnut in Russian. But they call him Kash for short. The Amur tiger cub and his three sisters were born in September at the Milwaukee County Zoo in Wisconsin. A month after the cubs’ birth, Kash developed an infection, as did one of his sisters, who died. Kash was sent to the zoo’s hospital for about two weeks. “That’s a little too long for him to be put back with his mother,” said Katie Kuhn, area supervisor of Big Cat Country at the zoo. Initially, Kuhn and the other keepers were concerned that Kash’s mother, Amba, might not allow him to be removed each day for feedings that would keep him alive. Later, they feared that Amba would reject Kash since he had been sick. To keep Kash alive, the keepers hand-fed him nutrients that his mother otherwise would have provided. Amur tigers are endangered, so helping to keep Kash alive is particularly important. The keepers spent 16 hours a day with Kash, feeding him six bottles each day. He now eats horse meatballs and is able to spend time with his surviving sisters, Eloise and Bernadette. He is learning how to hunt and socialize. “He needs to learn when another tiger is telling him to back off,” Kuhn said. Will there come a time when the zookeepers will have to stop hand-feeding Kash? Learn more about Lilian’s visit to the Milwaukee County Zoo.